The first in a four part reflection on the Glen Workshop, in which Dave Von Bieker gets scared, gets brave, and almost doesn't attend the Glen Workshop. When you market your event with the tagline, 'a week can change a life', you're stepping out onto some high, spindly limbs. First off, for an arts workshop with rich roots in writing, it can sound a bit cliché. We artists can be jaded folk, after all. And if that line is to be taken seriously, it presents a grand promise. A promise that must be proven. It's a risk, but as this year's theme was Art and Risk, I suppose the Glen was well aware. I can attest that the gamble paid off. A week at the Glen has changed my life, in ways both concrete and abstract beyond my comprehension. I am still not sure exactly why, in the middle of the Wednesday session with Jeffery Overstreet, I began to cry and was unable to stop completely for an hour. God was working in very real, mysterious ways throughout the Glen, and my own experience culminated in that Wednesday awakening, which I'll return to later. First, let me explain what the Glen Workshop is. 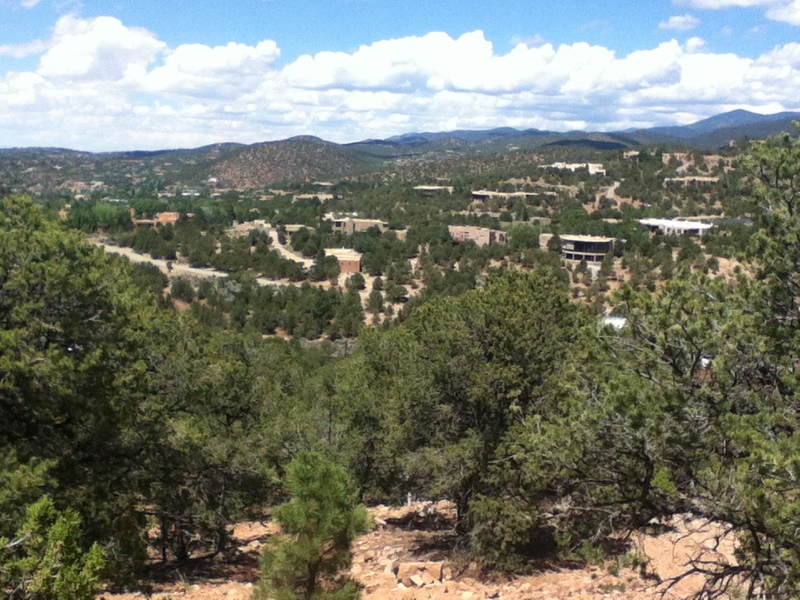 I attended one of two versions - the Glen West in Santa Fe, New Mexico. For one fee, you get a week's worth of art, spiritual formation, workshops, community, accommodations and food. Afternoons and evenings are packed with presentations by artists across several disciplines. We saw photographs of freckled faces. We heard the first act of a play. We viewed paintings and soaked in poetry. Richard Rohr, a Franciscan Priest led us in brief but deep evening ecumenical worship. Mornings at the Glen are for workshops, in the arts discipline of your choosing. There are several options, including one for those wanting a tasty sampler, called the Explorer's Track. I chose Songwriting. At least until it was cancelled. My road to the Glen was rather rocky, and perhaps that should have clued me in that something important was going to happen to me there. On the other side of every mountain is a valley, after all, and every peak must be climbed. The first stumble in my journey came as an ominous email informing me the Songwriting track was cancelled due to lack of interest. I had mustered up the courage to register. My wife assured me that it was OK. It was worth the investment. I was worth the investment. I'd paid all my fees (which led to other problems I'll get into later). I'd booked my flights. My track now cancelled, I could get a refund, but not on the plane tickets. I was going to Santa Fe in July, but now I had to choose what type of artist I wanted to be. I likely knew instantly that I should take Poetry, but Poetry terrified me. Even at a conference about Art and Risk, Poetry was too risky – too difficult. I toyed with safer options, but didn't feel right about them. I was offering up too much time and money to play this week safe. At the encouragement of friends, I signed on for the one Poetry track I felt to be the safest of two offerings. Then the second email arrived. That Poetry track was full. Would I take the other one? I sweat it out anxiously. You see, to call myself a Poet, I felt like a fraud. Like I was playing house. And this particular workshop leader wrote poetry that scared me even more. Poetry I couldn't fully understand and poetry that sounded nothing like my own. Poetry that hovered above my head. If anyone was to call me out as a phoney, it would certainly be her. But as the line formed behind me on the sky high diving board, I could do nothing but jump. Somewhere in the free fall, just about to be consoled by my own courage, I received another blow. An email arrived telling me that the company handling online registrations for the Glen Workshop had not been paying the Glen. They took my money, but never handed it over, and most likely would not. Because I had paid early on and all at once, I had in fact not paid. Would I have to pay twice? Could I not attend at all? Was all of this a sign to just stay home and stop trying to be someone I am not? Well I obviously went to the Glen Workshop, and they masterfully handled the payment situation. And no, these setbacks were not signs to stay home. But they also weren't over yet. The morning of the Glen, alarm set to 3 AM for a 6 AM flight to Santa Fe, my answering machine picked up a robo-call from the airline. My flight was cancelled. No reason given. No alternate flight offered. Simply cancelled. I think I laughed as I rose to stumble towards my email and arrange last minute travel in a 3 AM stupor. Waiting on the phone with the airline for nearly an hour I almost fell asleep between travel site searches. In the end, I got on a flight to the Glen, arriving late but still before my Monday morning workshop. It was going to happen after all. Knowing I had a lot riding on this Glen thing, what with the promise of life-change and all, I came prepared with two questions. The first was simple. Am I a poet? Is what I am writing poetry – proper poetry – and would other proper poets think so? The second question weaved itself through the week. What does a real, working artist look like? How do artists make a go of it and what life can I expect in 20 or 30 years? These foolish choices I am making now, where do they lead? I would hear answers through myriad voices across mealtime tables for seven glorious days. These questions in hand, exhausted from a perilous journey, I touched down in Albuquerque, New Mexico. Waiting for my Santa Fe shuttle, I did what I felt I should do. I wrote the week's first poem.